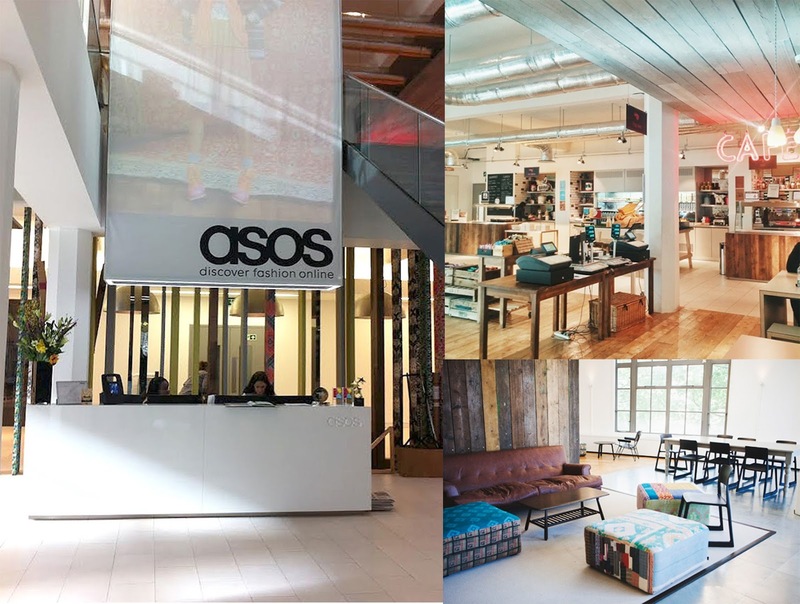 Love Your Job - Whats it like working in ASOS HQ? This week I was invited down to ASOS HQ for something very exciting which I will be able to share with you very soon. I love visiting this place, I always leave feeling inspired and eager to get back to my desk. I'm passionate about my job, as the saying goes "love your job and you will never work a day in your life". I've been selling on ASOSMarketplace almost three years now. Although I work in the fashion industry myself running a vintage clothing business from home, away from the UK's fashion capital is very different from working 9-5 in head quarters. I get asked a lot about what my job involves so while I was in HQ I flipped the table. I managed to catch up with Charlotte Welsh from the ASOSMarketplace team to find out what it is like working for one of the UK's biggest online retailers, her love for London and vintage clothing. Anna: Have you always wanted to work/live in London? Charlotte: I've always lived in London, apart from when I went to Uni. I love London, it's my home and I think it's a great city to live in - it's very visual with so much creativity. I find it inspiring. Saying that when I spent 7 months in India, I realised it was definitely somewhere I could see myself living, the culture was incredibly inspiring. Anna: What did you study at University? Charlotte: I did go to University, I studied Fashion. It was a really good course, as it taught me about many different aspects of the industry, from sourcing and designing, to cutting and production, to managing the financial side of your business. Anna: What was your first ever job? Charlotte: My first ever job was working for an ethical fashion label called From Somewhere - where I was thrown in at the deep end in terms of cutting and production. I was very lucky to be able to take part in a live event where I had to make an outfit on stage ..... timed. It was very nerve racking but so exciting. I learnt a lot about running your own business too and the importance of sustainability in the industry. Anna: So what is a typical day for you working in HQ? Charlotte: One of the great things about my job is there are so many different aspects of it, it isn't ever routine. Sometimes I'm on visits to sellers, to give them tips on development and generally have a catch up. Sometimes I'm out scouting for new boutiques to take on board. When I am in the office, I spend most of my time working with boutiques to help them grow, and generally being on hand to help with any queries they might have. Anna: You have a vintage boutique yourself on ASOSMarketplace called Pre-Loved Paradise. I know first hand how much time it takes to photograph and list new stock. How do you find time to manage your boutique alongside your busy full time job? Charlotte: It is incredibly difficult to find time and it is something I need to work on more. At the moment I buy occasional pieces throughout the week doing the rounds of local charity shops and keeping a look out for any hidden treasures to top up on stock so as to keep presence on Marketplace. I spend the weekend shooting and editing as much as I can. It's much easier in the Summer months as the days are longer and shooting outdoors is possible when I get back from work during the week, but in the Winter I have to pack shoots into Saturday and Sunday. Anna; What do you love about vintage? Charlotte: I love vintage for it's history. Knowing something has had a long life span before it has entered my wardrobe and knowing I am contributing to it's story is so exciting. I also love the uniqueness of vintage, knowing an item is so rare or even a one off allows you to be individual and appreciate how special it is. Anna: Working at ASOS you are surrounded by fashion. What's your favourite piece this season? Charlotte: I'm obsessed with print and texture, so I'm excited for anything with bold and colourful pattern and preferably in an oversized form. Anna: Is there anyone/where that you look/go for outfit inspiration? Charlotte: My Nan has always been my style inspiration, she's amazing at putting together really unique pieces, a lot of which are bright, colourful printed items. I've actually acquired a lot of my vintage clothes from her|! I take inspiration from a lot of different cultures and styles and mix them together. I think FKA twigs is such a creative person who uses clothes as an expression of herself. I find that inspiring. OOTD - Crop Polo Top: asos.com / Skirt: Vintage Christian Lacroix (Pre-Loved Paradise) / Cardigan: Vintage (My Nan's) / Silk Headscarf: Vintage (Portobello Market) Anna: Any advice to anyone wanting to get started in the fashion industry and work within HQ? Charlotte: From personal experience alone I'd stress the importance of testing out various fields within the industry. For those who aren't certain of the area they like best, or are strongest in, trying different Companies and different roles will help expand their knowledge, experience and network. October is my favourite month for so many reasons, Halloween being my absolute favourite followed closely by pumpkin spiced lattes. I always plan a seasonal shoot for my homepage and this year was no exception. Despite life being at its busiest I still found time to frolic in the autumn leaves and enjoy this colourful season. Last year I spent more time behind the camera than in front of it, I worked with several models who were fantastic. This is one of my favourite shots from the Halloween shoot I did at the Botanical Gardens in Sheffield last October. I had some amazing 90's velvet dresses in stock this time last year. 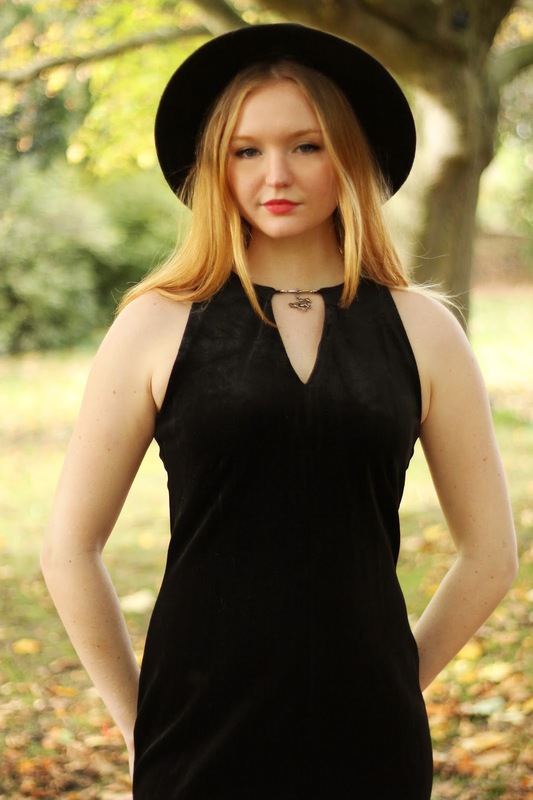 I styled this particular one with a black fedora, this moody Gothic look worked perfectly for this shoot. Halloween is the perfect opportunity be creative with makeup. 2013 was the very first year I put together a Halloween shoot for ASOSMarketplace. I collaborated with MUA Zoe Peplow brand ambassador & trainer at Illamasqua. Zoe kindly freelanced this shoot for me and created a really dramatic smokey eye, and ombre lips. If you're after some inspo this year her makeup tutorials are worth checking out. This year October has been a whirlwind, It's been a challenge squeezing everything in. My 2015 Halloween shoot is now up on my website & ASOSMarketplace. Featuring one of my favourite vintage faux fur coats which arrived this week along with some other bewitch'in vintage finds. Take 10% off all new stock with code TREAT and you might even find a chocolate pumpkin hidden inside your order. BIG NEWS!! 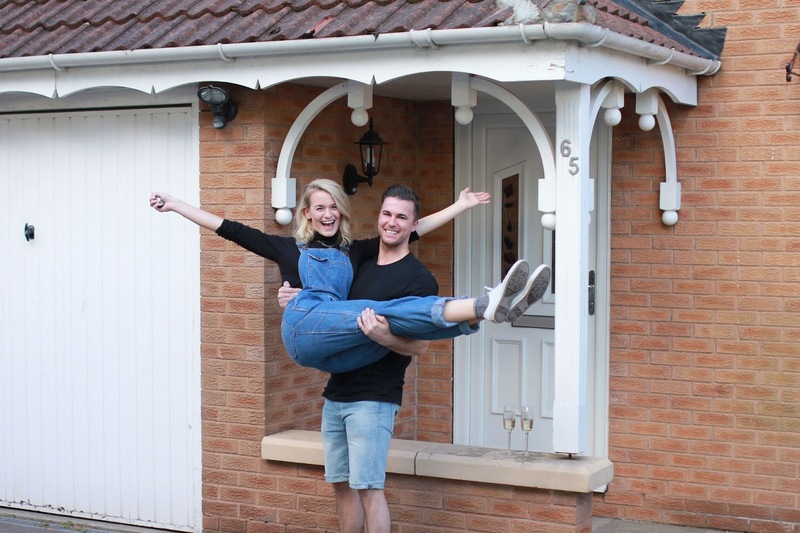 I am super excited, my boyfriend and I have just bought our first house together! Yes I am a homeowner, and now bills come before new boots!!! *sad face*. We picked up our keys last week and have not stopped since. We currently have no furniture, crockery or fridge but that didn't stop us. The novelty of ordering a pizza to your new address is so much fun. A picnic rug, a pizza and a bottle of prosecco was all we needed to celebrate the first night in our new home! This exciting new chapter of my life will bring a few new topics to my blog along side my outfit and fashion posts, there will also be a few vintage home and interior posts. I have been inspired by the lovely Emma Warren and her blog The Turquoise Door, a fellow boutique owner on ASOSMarketplace who has/is building her dream home in Bristol! I have been collecting bits and pieces for the last year or so and my bedroom currently resembles and antiques emporium. I can't wait to give everything it's own place. 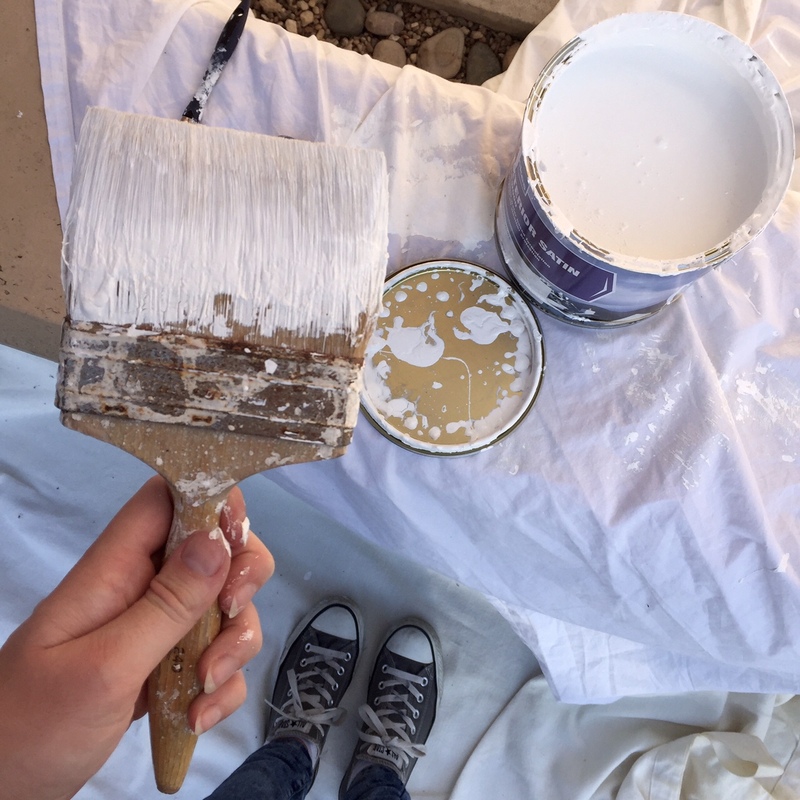 I'll be sharing my finds here on the blog, but before I can make it look pretty we have got the messy jobs to do! One of the perks of working from home is that you can do a spot of DIY on your lunch break! I'm excited to be keeping a little memoir of my progression here on my blog and I hope you enjoy seeing me make my house my home! This was not put together as an outfit post, but yes I am wearing my dungarees yet again. The co-ordinated couple look was totally unintentional - honest, but I do hope our taste in decor matches just as well as our wardrobes!